The Orchard Event Venue & Retreat is pleased to announce that they have been selected as a 2018 winner in The Knot Best of Weddings, an award representing the highest-rated wedding professionals as reviewed by real couples, their families and wedding guests on The Knot, the leading online wedding brand and app. This is the 7th year The Orchard has been selected for The Knot Best of Weddings. 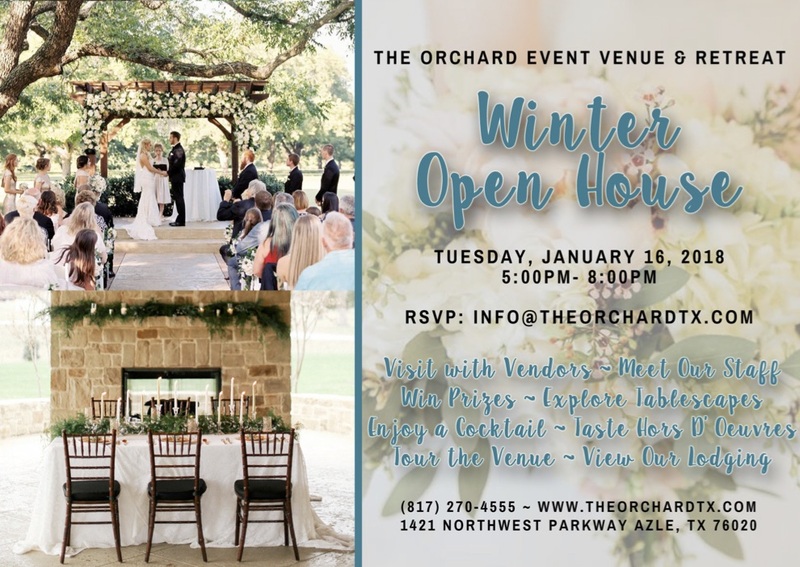 The Orchard Event Venue & Retreat is hosting an Open House on Tuesday, January 23rd, 2018 from 5pm-8pm (rescheduled from January 16th due to the weather). For more info on the complimentary event visit: https://www.facebook.com/theorchardtx/events. Located in one of the most stunning outdoor settings in the Dallas/Fort Worth area, The Orchard Event Venue & Retreat offers a picturesque backdrop for your wedding that will take your breath away. With multiple sites, located on over 100 acres, available for gathering with loved ones, hosting a rehearsal dinner, ceremony and reception, your wedding at The Orchard Event Venue & Retreat will be the event of a lifetime for you and your guests. The Orchard also offers on-site lodging featuring a six-bedroom lodge with outdoor pool and beautiful cabins that are a great alternative to staying in a hotel. The fifteen cozy cabins are nestled among the towering oak trees, complete with fire pits and outdoor games. The lodging options at The Orchard are perfect for post-wedding family time as well as pre-wedding preparations. Please visit The Orchard online at TheOrchardTX.com and follow on social media Facebook.com/TheOrchardTX and @TheOrchardTX on Twitter and Instagram. The Knot is the nation's leading online wedding brand and app that seamlessly engages, matches and connects couples with the right products, services and local wedding professionals they need to plan and pull off their wedding. The trusted brand reaches a majority of engaged couples in the US through the #1 wedding website TheKnot.com, its mobile apps, The Knot national and local wedding magazines, and The Knot book series. The Knot has inspired approximately 25 million couples to plan a wedding that's uniquely them. The Knot is the flagship brand of XO Group Inc., which helps people navigate and enjoy life's biggest moments—from getting married to moving in together and having a baby. Please visit The Knot online at TheKnot.com and follow on social media:Facebook.com/TheKnot and @TheKnot on Twitter, Pinterest and Instagram.